I’ve been obsessed with this show since it’s premiere episode. After one show, I said the unthinkable: this might be in the same realm as Arrested Development. It was a bold statement–and I stand behind it after half a season of episodes. It’s not AS GOOD as AD, but it’s the closest thing on TV in my opinion. The writing is very good. VERY Good. Jokes have layers and each episode ties up nicely–usually in unpredictable ways. But the writing is kicked up a few notches by the actors delivering the lines. Man, the cast on this show is good. It’s hard to find the weakest link. I love Phil: his cool-dad character is hilarious to watch. I’m also a big fan of Jay, Gloria, and Manny-each are so funny. Manny is just great. I’m constantly trying to pick my favorite character but they are all so good, it’s impossible. Tonight is a new episode and I can’t wait. Modern Family is gold. Awesome. I love this show! It’s so well-written and hilarious and different than typical sitcoms. Thank you for introducing me to it, and I promise I will start watching more. This is one of my favorite shows on TV, too. I love, love, love Cam and was surprised to find out that he was straight in real life. 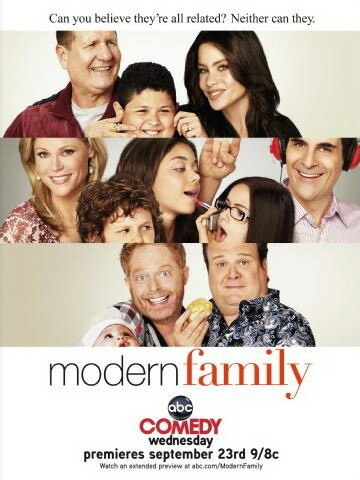 As someone who just started watching Arrested Development on DVD (yes, I KNOW, I’m behind the curve on that one), I can say that Modern Family is in the same vein of awesomeness. A show with Keri Russell and Will Arnett? I am so there. I really love this show too. And Melia, I’m so excited you’re watching AD. I told Nick the other day that I saw on your facebook that you and Darren were starting to watch and still had a couple seasons left. I then told him how jealous I was — because you still had so many funny moments ahead of you! Seriously, discovering that show was one of my favorite TV moments ever. Ha, I know the feeling, when people are just starting to discover my favorite shows. One of the best things about AD is that the episodes are so short, especially without commercials. We tend to work long days and watch episodes during meals and to finish out the day. Yeah, we do need to do more happy hours. Wish the Kailua crew lived nearby to pull us away from our computers.